This page was designed for only players who want the highest limit poker sites. We’ve scoured the internet looking for the best places for the CEO’s, Moguls, and Celebs of this world to test their skills at the high limit internet poker scene. These rooms offer the highest stakes where well known online poker pros are consistently playing. If you were looking for a high stakes casino guide we have that as well. These high stakes internet poker rooms are not for the poor as most have buy-ins of about $10,000 limit or more. BetOnline.ag $50-$100 $50-$100 This site has the highest stake games in the US. The mid high stakes $30/60 are most active. Pokerstars.com $200-400 $500-$1000 Most active non-USA room. Stakes get very high here. As of January 2010 these are some of the biggest hands ever played online, along with some of the biggest losers. One included a pot worth almost $1.4million dollars between a player, Patrik Antonious and Isildur1 at Full Tilt. There has been some serious money changing hands, between $4-6 million dollars between a few players in a span of a month or two. The Reviews below are inactive due to “Black Friday” and the closure of those sites. Please refer to the above section for high stakes games. 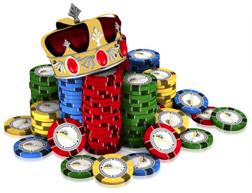 Ultimatebet “used to” by far has the best high stakes poker on the internet. The biggest stakes have now turned to Full Tilt. The stakes are quite large but not easy to find full games because of the cheating scandal. The high stake tables are usually ghost towns like some other places that claim to have big games. The high stakes NL Texas Holdem tables tend to be pretty full of noobs. There are generally 3 full tables at all times at the $50/100 stakes.This may not seem like a lot but it is for high stakes online. Players tend to enter with $10,000 or less. The tables are both ring (10 man) tables and 6 man tables. John Travolta plays the $50/100 stakes a lot and you can usually see him under the screen name “John Travolta.” Real original John. Annie Duke, Antonio Esfandiari, and Phil Helmuth also play there. The high stakes Limit games are pretty juicy. The biggest blinds are the $150/300 and have 6 man, 10 man, and heads up tables. The heads up tables are very active. Players will usually buy in with $30,000 at the $150/300. The Limit tables with $100/200 blinds are more active with players bringing $20,000 to the table on average. Game Type Higest Stakes Most Players At..
Fulltiltpoker.com has a very popular high stakes poker room. To play the high limit games you must be a regular, as Full Tilt will not allow any player to sit at the high stakes table. Their customized security makes you email them so they can do a background check on your table play before sitting down at the higher limit tables. There are a lot of professionals that play nightly such as Phil Ivey, Mike Matusou, John Juanda, Patrik Antonious, and many online pros. This is just to name a few. These pros draw a lot of action to the high stakes tables and of course most of the internet sharks play here as well so watch out, they are the best in the world. The $50/100 NL games usually are not full unless Phil Ivey is playing. Generally there are a bunch of $25/50 NL cash games going on. Most players enter with $10,000 in cash at the $50/100 NL games and $5,000 for the $25/50 NL tables. The $300/600 games are relatively new so not a lot of people play those stakes. There is actually a $500/1000 NL cap table. Lately they’ve been playing a lot of mixed games as well for high limit poker. The Limit high stakes games are not as popular. It is hard to get players to play at the $1000/2000 tables because you need such a big bank roll. Please be very careful when playing high stakes online poker. You can lose a lot of money very quickly so please don’t play with your kids college funds. We also have created a high stakes casino section for players who prefer higher limit baccarat games, craps and the higher limit blackjack online.